I can't believe it's been over a month since my last sample stash post! Here's my thoughts on some of the samples I've been trying lately. Dr. Bronner's Peppermint Castile Liquid Soap (236ml RRP £5.49): I'm sure most of you will have heard of Dr. Bronner's Magic 18-in-1 soaps before! With so many uses for it you can't go wrong really. I read somewhere that this is the brand's most popular fragrance and I can see why with minty scents being one of my favourites (along with citrus and coconut). Definitely a handy addition to any household. Weleda Citrus Creamy Body Wash (200ml RRP £7.95): Considering I usually like citrus scents this one just wasn't quite right for me. It's a good product though, leaves you squeaky clean! I'll be trying samples of the other scents I think. Marble & Milkweed Nourishing Serum (full size £24.00): This sample came in abeautifulworld's Summer Sampler box and I only recently got around to using it! You only need to use the tiniest amount at night and by morning you'll have noticeably glowing skin. I just don't think I would purchase it as I'm not really keen on the scent (not sure what it was!). Lavera Young Faces Organic Mint Moisturising Fluid (full size £10.90): I loved this! It has clarifying and slightly antibacterial properties for oily and impure skin. I got a few uses out of this sachet when I had the start of a breakout - it definitely stopped it getting any worse and seemed to help it all clear up quicker! This is going straight on my wish list! Lavera BB Cream (full size £17.90): Oh Lavera you fabulous brand, you keep making me love you more and more! This Beauty Balm is yet another great Lavera product. It has a light coverage as to be expected from a BB cream/tinted moisturiser. The colour seems a little dark at first but blends in really well. Another one to add to my wish list for next summer! I have loads of those Lavera samples - I really should get round to using them up! I love the Dr Bronners soap, haven't tried the peppermint scent though! Love these kinds of posts! Great selection of brands I love too. I would love to try that Lavera BB Cream. These look like good products, love the post idea too! 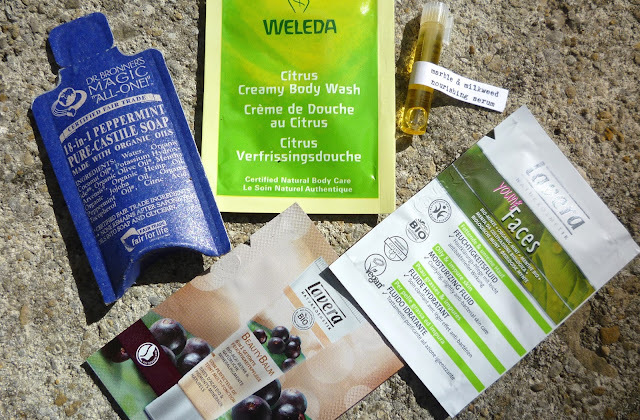 I haven't tried any of these products before, but I've used the Weleda birch oil - it's supposed to help with the nasty cellulite. All in all, loving Weleda products :). I really want to try the soap! I never found a BB Cream that I liked this summer so maybe I'll try the Lavera one next year too, it sounds lovely.